Nintendo's famous plumber was dead before you ever put Super Mario Bros into your NES. For many gamers, the box art for Super Mario Bros may be their first memory related to videogames. It's immediately iconic: Mario, in his fire-flower power-up suit, jumps through the air against a backdrop of stone and lava - the sort found in one of King Koopa's many castles. However, Reddit user Deluxo noticed something disturbing about this famous, memorable piece of videogame box art: It depicts the death of Mario. As you can see in the screenshot here to the right, the particular combination of jumping, stone wall and lava can really only be found when Mario is falling to his death in a lava pit. So rather than showing children their hero triumphantly leaping through the air, this box art shows Mario's as he plummets to his demise, throwing one final defiant fireball before he is consumed in flame. Boy, that's kind of morbid, huh? Not many other videogames have the gall to show their hero - and the player's avatar - in the throes of death on the box art. In fact, I can't think of a single one. On the other hand, this could have been Nintendo's warning to children who had no idea what they were in for. 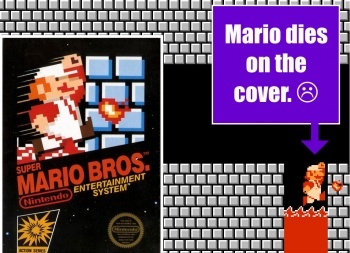 After all, you can't say Nintendo didn't warn you that you would be spending hours leading Mario to his death if it was right there on the cover.